He wishes he were more like Amar’e Stoudemire, and he’s told he could be another Taj Gibson. But Bulls summer leaguer Malcolm Thomas is just trying to be a defensive role player who finds a spot on the end of the Bulls bench this season. And he probably has the best chance among the Bulls NBA Summer League players, who fell to 0-2 Wednesday in a 96-88 loss to the Houston Rockets. 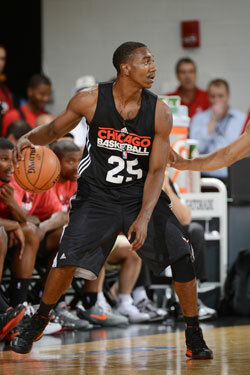 This summer league for the Bulls primarily is about developing both Jimmy Butler and rookie point guard Marquis Teague. Butler had another good effort with a team-high 24 points, including 11 of 12 from the free throw line, with seven rebounds. Butler is 21 for 24 on free throws in the two games. He’s been the unquestioned star of the team, though he tends to be left out more than he should be with Teague learning how to play point guard with an NBA team and run an offense. Teague is more a scoring point guard. So he’s been hesitant at times whether to score or create for others. Though the offense the Bulls are running is set to feature Butler, he got just 11 shots Wednesday to 13 each for Teague and shooting guard Ramone Moore. Teague was better after a struggling opening game as he had 14 points on six of 13 shooting with five assists and five turnovers in Wednesday’s loss. It is nice to be confident. But Teague has a lot of work to do on that shot, which was mostly awry again. Teague did hesitate less than in the opening game and got to the rim more. He’s clearly a penetrating guard and has some nice quickness. But his shot is a weakness and he doesn’t seem to do well yet finding teammates if not in transition. He again made several careless turnovers and was beaten by the opposing point guard, this time rookie Scott Machado, who had 20 points and six assists for the Rockets. Of course, it’s just two games for a 19-year-old. He’ll be able to handle backup point guard duties, though not likely this season. It wasn’t a very good effort again from the Bulls team as they fell behind 31-20 in the first quarter even with Houston sitting out its best summer league player, European rookie Donatas Montiejunas. The Bulls pulled within 52-49 at halftime behind 13 from Butler, who again showed impressive strength and quickness in getting to the rim and getting fouls. He’s still not shooting the ball with much range, but his defense again has been very good. It seems Butler will easily move into the bench role Ronnie Brewer was playing. Teague doesn’t appear ready to be a backup player for Kirk Hinrich, who will be signed to open the season at point guard once the Bulls resolve salary cap matters around the offer sheet expected from Houston for Omer Asik. The Bulls have not given any indication whether they will match. They are expected to add perimeter shooting forward Vladimir Radmanovic as a replacement for Kyle Korver off the bench after Korver was traded to Atlanta. The Bulls also remain in the market and are expected to add a veteran backup center and a shooting guard. Darko Milicic is the latest to be rumored as one possibility, though he is not said to be the team’s priority for a backup big man. If Asik is retained, the Bulls still want to add another center and tried unsuccessfully late last season as well. Houston has more high level young talent on its summer league team than the Bulls with first round picks Royce White, Jeremy Lamb and Terrence Jones all playing well. They pulled away to lead 77-68 after three, and though the Bulls made another late run the Rockets maintained control. Leon Powe showed a bit more life with nine points in about 15 minutes. Former Illinois point guard Demetri McCamey played well. But given the Bulls focus on developing Teague, McCamey isn’t getting much playing time. If there’s anyone who might grab a roster spot or at least a training camp invite, it’s Thomas, who also had 10 points and a block. He’s perhaps an inch or two shorter than Gibson and a bit light. He is listed at 6-9 and 225. But he’s impressively athletic with legitimate NBA shot blocking ability and a nose for the ball. Thomas has little offensive game, but finds the ball on the offensive boards like with a late offensive rebound and put back jam that brought the Bulls within five late in the fourth quarter. His jump after a rebound is exceptionally fast. Thomas has piqued the interest of a lot of teams and played a bit for the Spurs last season after playing in Korea and the D-League. Because of his smallish power forward size but leaping ability, Thomas first was played outside at small forward at Pepperdine and then played center at San Diego. If he could make a 15 footer with consistency, he’d be on an NBA roster. I’ve heard him also likened to Dante Cunningham, who played a good role in Memphis last season. The Bulls will not play Thursday and then finish off summer league against Golden State Friday, the Clippers Saturday and the Bucks Sunday. The Bulls are expecting the Houston offer for Asik Thursday or Friday and then will have three days to decide on matching. At that point, they’ll finalize a deal with Hinrich and will remain in the market to fill out the bench. And eventually, Thomas could get a call.